-RCA, RCA to 3.5mm Jacket, For some TV models, you may need a extra converter and coaxial/optical cable. 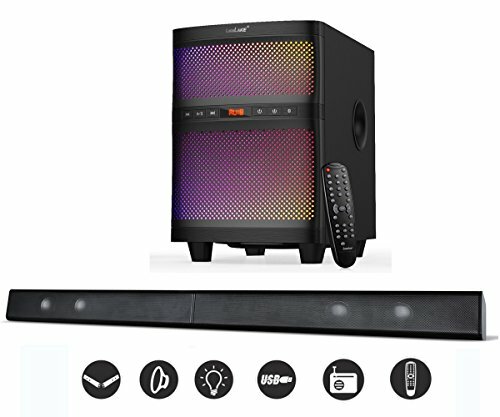 LuguLake TV Bar, with 6-color LED lights in wood subwoofer, is definitely a nice decoration in the house. This speaker expands the applicable environments. You can use it at the party, at studio, at yoga, at gym, at home theater or living room. One year warranty, and lifetime free easy-to-touch technical support. Any connection issue please contact us by email or call. 2-in-1 Transformers: Length & Power Output: 31.5"(15.7" Each) in Total; 110dB (2.1 channel); freely assembly to a inch sound bar or detach to 2 pieces satellite stand speakers. Wood Subwoofer: Big 8" driver subwoofer; 6-colors LED flashlight, light can be turn off. Light your room and delight your viewing. Specification:Subwoofer Frequency Response:30Hz-104Hz/Satellite:135Hz-20KHz; Power Supply: 110V~60Hz 0.4A; Signal input: RCA jack; Separation:40dB; S/N Ratio:70dB; One year warranty, lifetime tech-support. If you have any questions about this product by LuguLake, contact us by completing and submitting the form below. If you are looking for a specif part number, please include it with your message.